The Classroom, across the open space from the olive avenue. The remnant Eastern Suburbs Banksia scrub is seen behind the building, the eucalypt grove at right. 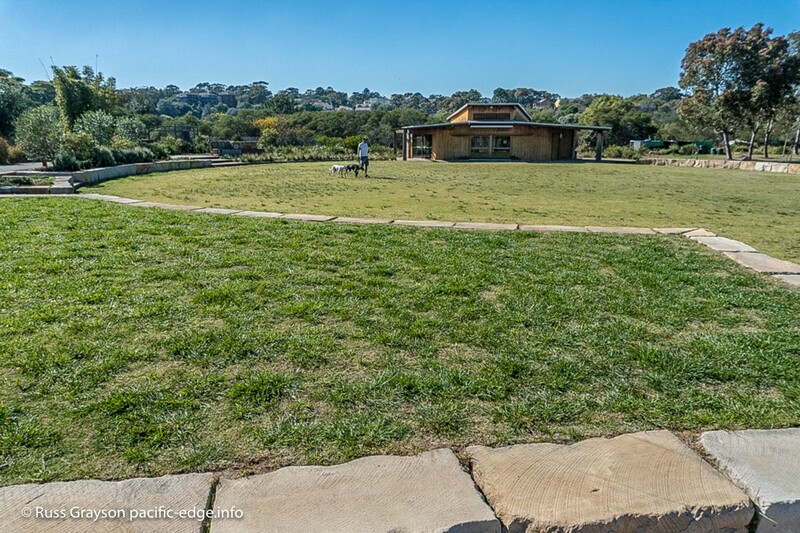 It was one of those design challenges that require more than a little thought: how do you turn an expanse of low-grade lawn into a multiple-purpose space that also increases the vegetative biomass of Munda Street Reserve? Biomass in our cities is important in maintaining the ecological services we depend on, as well as providing habitat for wildlife — food, refuge, nesting, water and the other needs of the birds, insects, lizards and other animal life that make up nature in our cities. The segmentation of what was a large oval by the sandstone-defined implied circle is seen in this Google photo. The Permaculture Interpretive Garden is visible at upper right, beside the path. The path curves into the olive avenue. 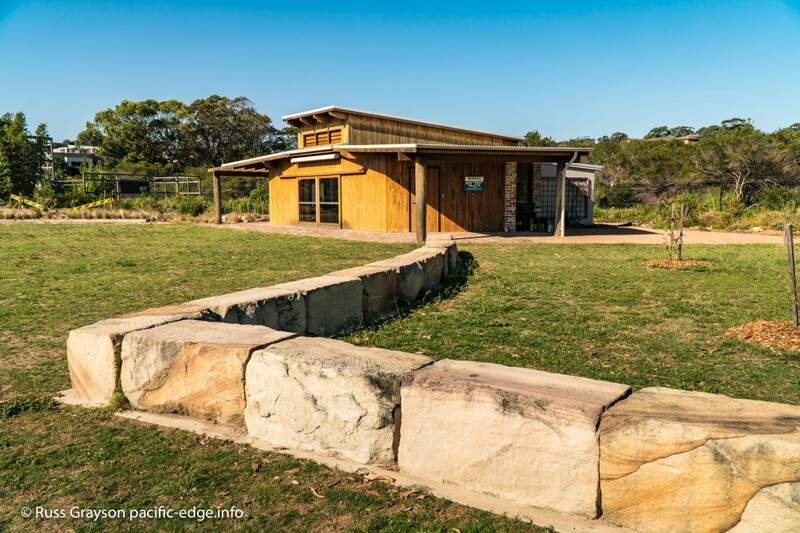 The corridor between the Classroom at mid-right and the fence of Randwick Environment Park is landscaped as a wild foods trail and for habitat. The Habitat Trail is seen at lower left. Assessing the chartacteristics within a site and the influences coming into it from outside is known as site analysis. It is important to the design of a site and influences it, such as in the placement of structures and vegetation. Nothing of Aboriginal archeological value was found on site. European peoples’ use of the site started in the late-Nineteenth Century. The site and surrounding area has a long history of military use. Earlier in the Twentieth Century the area was used by the Army and included a rifle range. In the 1960s to the 1970s the wetland area was sand-mined and enlarged to the present size of the ephemeral wetland. The topography was substantially altered. Native vegetation returned from seed remaining in the soil. Later, mounted-police horses were retired here. The Munda Street Reserve, the Randwick Environment Park and the land where the Randwick community Centre building stands was once the location of large warehouses, a logistics base supplying the Allied navies in the Pacific in World War Two. The Defence Department remediated the area to remove contaminants and handed the site and community centre building to council in 2007. The public participation process to gather ideas for how the site would be used took place in 2010. The site, in effect a rehabilitated industrial area, was then developed as a regional park. These are the properties of the site itself. movement and site use — understanding how people move around and use the site is important in public place design; useful information was found in the management plan for Randwick Environment Park, the remnant bushland and ephemeral wetland that encloses Munda Street Reserve on its eastern and southern boundaries; the main path through the site is a combined pedestrian/bicycle path and carries most of the pedestrian traffic. It is reasonable to expect that pedestrian movement will follow the main paths through a site, especially when the path connects residential areas, such as that of the Randwick and Maroubra side north and south of the Reserve. The path through Randwick Environment Park, along the northwestern side of the ephemeral wetland, is an informal, sandy bush track connecting the ends of the paved path. The idea is that the track will eventually be formalised to allow disabled and easier access for less-mobile pedestrians and parents with strollers, although in a form less-environmentally-intrusive than the paved path around the Reserve. Observation is the method of verifying how people move through the site and where they linger on-site. It disclosed a desire line, and informal route taken by pedestrians, diagonally across the open space of the Reserve. The shortcut connects the main path with the informal bush track. Linger nodes are locations where visitors gather. 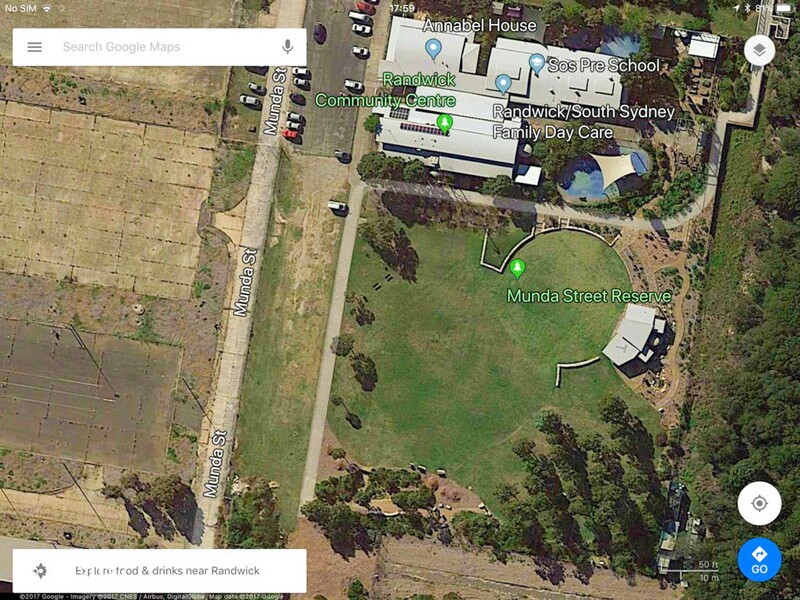 Those on Munda Street Reserve include the Meeting Place plaza adjacent to the community centre building, the eucalypt copse, seating on the southern side of the Reserve and that adjacent to the Meeting Place plaza and its cottage garden of native and exotic plants. All of these places have park bench seating. External influences originate outside the design site and influence it. runoff — even during heavy rain there is seldom standing water; rainfall drains rapidly into the sandy soil. Let’s look at the redevelopment of the site through permaculture’s needs>functions>yields model. design to accommodate use of the Reserve for events and festivals. improved seating through the site. facilities for events on the Reserve, such as the grassy platform on the northern edge of the Reserve designed and equipped with power for use as a bandstand during events. The design had to accommodate the existing passive and active recreational use of the Reserve as well as the annual eco-fair, Earth Day and other events that use the open space. It had to take into account the increasingly-rare and endangered small birds that feed on seeds on the lawn area. New landscaping and vegetation had to complement and extend the habitat value of the adjacent five or so hectares of Eastern Suburbs Banksia Scrub, of which only around five percent remains in existence. The solution for the open space was to make a segment of a circle formed with large blocks of sandstone, beyond which was a larger area of open space covered in lawn. This space serves active and passive recreation, important uses of urban parks that help people destress and which stimulate mental health. Sandstone blocks were chosen for their durability and capacity to serve other uses. They are low-maintenance, an important factor in municipal, public place design where staff have limited time to maintain facilities. Seen from the gabion/sign near the Classroom, the implied circle is defined by the sandstone edge. The grid-connected wind turbine towards the end of the olive avenue, outside the community centre building, complements a rooftop photovoltaic array and offsets energy use in the community centre and other buildings. The circular sandstone-enclosed segment focuses on the classroom, a building made substantially of reused materials. That is so it can be used during festivals as well as in its usual role as a meeting place and classroom for council’s community courses and workshops. Looking across the oval to the Classsroom. The grassy area in the foreground is used as a bandstand during festivals. During festivals, the semi-enclosed place becomes an area for activities while stalls are located in the larger area beyond. Sandstone blocks delineate the area focused on the Classroom. Young trees that will later provide shade have been planted. The revegetation of the strip along the path which follows the eastern fenceline and the Eastern Suburbs Banksia Scrub beyond, is seen behind the Classroom. It will have educational value as the Wild Food Trail, displaying species that can be eaten. The passage behind the classroom, which follows the eastern fence around the Randwick Environment Park is landscaped with species of habitat value to wildlife. It serves as a buffer between the Reserve and the Environment Park. The planting of wild foods is an educational feature designed to familiarise visitors with nature and its uses. 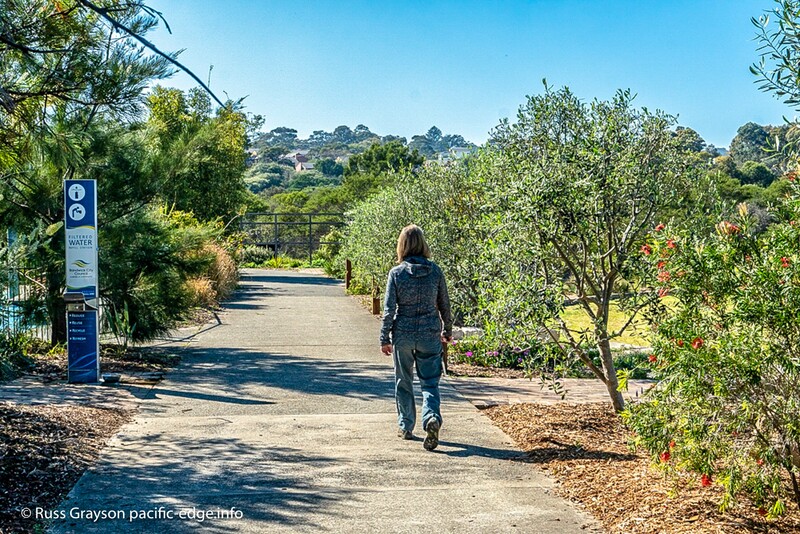 A path, paved and graded to be accessible to less-mobile people, links to the main path along the edge of the Permaculture Interpretive Garden, passes along the passage behind the Classroom then through the eucalypt grove to join the Habitat Trail along the south-western edge of Munda Street Reserve. The Trail is used for the council’s primary and pre-school basic science program. 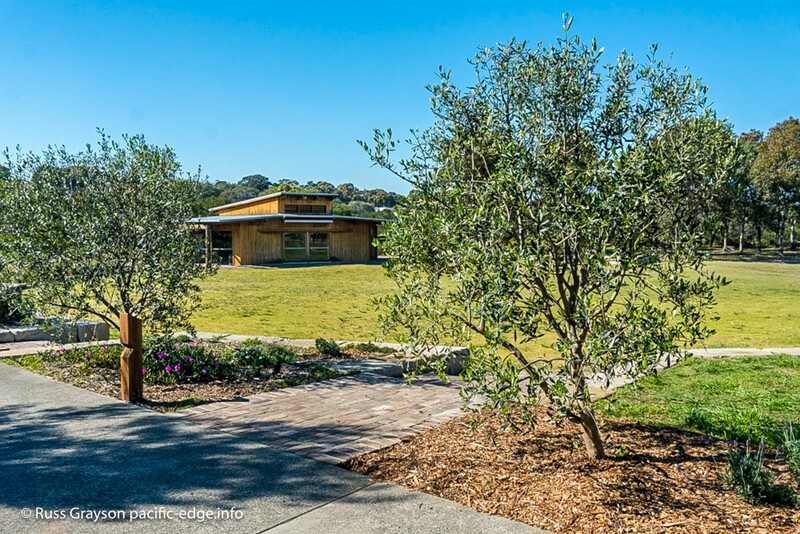 Landscaping in the form of an olive avenue underplanted with Australian shrub and groundcovers extends from the end of the Permaculture Interpretive Garden, alongside the community centre building to the Meeting Place plaza. The olive avenue is part of the shared walkway/cycleway that links to Randwick Environment Park. It is the main movement corridor through the site and connects it to surrounding residential areas. A woman walks along the olive avenue. The avenue is part of the walkway/cycleway that passes through Randwick Sustainability Hub. The filtered water station was installed to discourage the use of single-use plastic bottles and features a tap at dog-height for people walking their on-leash animals through the site. The diversity of vegetation along the path, planted as a groundcover/shrub/canopy layer of olives, Callistemon (the red bottle brush, established for small birds and insects) and other species provides habitat, shade and amenity value. It forms a visual line delineating the grassy open space of the Reserve from the adjacent community centre building. On the other side of the path are species established when the community centre was built: grevillias, dianella lily and angophora trees. It is said that a design is successful when people use it for purposes not intended by the designer. 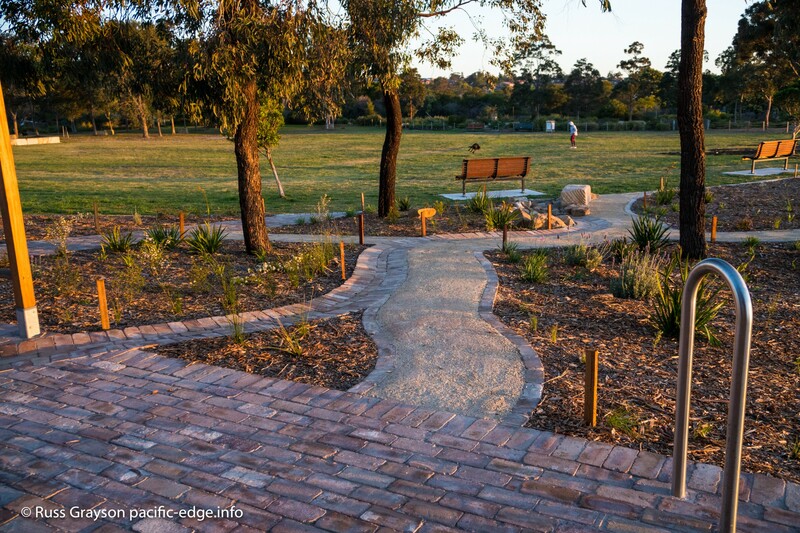 By that criteria, the use of the sandstone border around the circular segment of Munda Street Reserve by the childcare centre in the community centre marks it as a success. The Centre is a regular user of the site. Teachers take the children along the sandstone blocks, through the bicycle parking hoops and other design features in an outdoor gym circuit. Tertiary students also use the site for their studies. Let’s look at the redesign through the lens of the design principles of permaculture design system co-founder, Bill Mollison. Most of these principles appear in his book, Permaculture, a Designers’ Manual. The set of design principles later developed by the other co-founder, David Holmgren, complements Bill Mollison’s principles. Use biological resources: The planting of shade trees and a mixed Australian native, exotic and bushfood species along the fencelines makes best use of vegetative, biological resources to improve and diversify the local environment and increase urban biomass. The habitat value of the plantings benefits wildlife. Each element performs many functions: Seen as a landscape design element, the open space of Munda Street Reserve facilitates its use for festivals and events as well as for active and passive recreation. Landscaping offers functions such as shade, wildlife habitat, botanical interest and education. Cycle energy, nutrients and resources: The management of the landcaping is through organic methods. Composting plant material wastes for use as fertiliser on the gardens, the inclusion of legume species to supply nitrogen-nutrients and the use of mulch cycles wastes and other resources. Use diversity: The mix of species and the options for different uses of the site bring biological, social and edcuational diversity to the redevelopment. Use edge effects: An edge is the interface between two systems. The landscaping along the eastern and southern fences of Munda Street Reserve separates the managed landscape of the parkland from the adjoining wild landcape of the Eastern Suburbs Banksia Scrub of Randwick Environment Park. It is an edge where native and exotic species blend, and forms a barrier to the movement of seed from the gardens into the bushland. Work with nature rather than against it: To work with the natural conditions of the site, landscaping species were chosen for their adaptation to the nutrient-poor, free-draining sandy soils of the Reserve, exposure to the drying effects of the hot summer sun and resilience in coping with the cold, blustery southerlies of winter. The problem is the solution: The solution to the problem of local environmental conditions (see above principle) was selecting appropriate species for landscaping, as it was the solution to the problem of limited staff time and budget for landscape maintenance. The problem of accommodating the range of uses of the Reserve’s open space lay in collecting information, through observation about how people use the Reserve, then rethinking its design. Make the least change for the greatest possible effect: Like any good permaculture design, the design solutions for the redevelopment of Munda Street Reserve started by working with what was at hand. Taking the ‘least change’ approach, the design did not substantially remake the entire Reserve. Through thoughtful observation and design thinking combined with a knowledge of the local ecology, permaculture design, landscape architecture and horticulture, the Reserve was tweaked to multiply use-options and increase habitat, educational value and urban biomass. Everything gardens: Everything modifies its environment to provide its needs and sustain and increase the resources it requires. Animals do this. So do plants. And humans. So did the redesign and redevelopment of Munda Street Reserve when it sought solutions to diversify the uses of the site, increase its benefit for wildlife and its educational value. Dry, freely-draining soils, exposure to the hot sun of summer and choosing vegetation adapted to climatic conditions were the main natural challenges inn site development. There were also human challenges. The natural values which led to Commonwealth and state government environmental protection were behind the declaration of the Reserve as dog-free. Dogs not only disturb and kill wildlife like blue-tongue lizards, they deter the small birds which feed on grass seed on the lawn and their droppings pollute soils and natural systems with phosphorus. Despite there being a dog-off-leash park a mere 300 metres or so from the Reserve, as a concession to local people council made the Reserve dog-on-leash so dog owners could walk their animals there. What happened was that some dog walkers chose to forget the concession council made and to ignore the Reserve’s on-leash status. Choosing to break local regulations, they release their animals to run on the open space irrespective of the presence of children and wildlife. This has necessitated the time and expense of a periodic council ranger presence in the Reserve. Because of the significant habitat and scarcity of the natural systems of the adjacent remnant bushland of Randwick Environment Park, the area came under the protection of Commonwealth and state government conservation legislation. 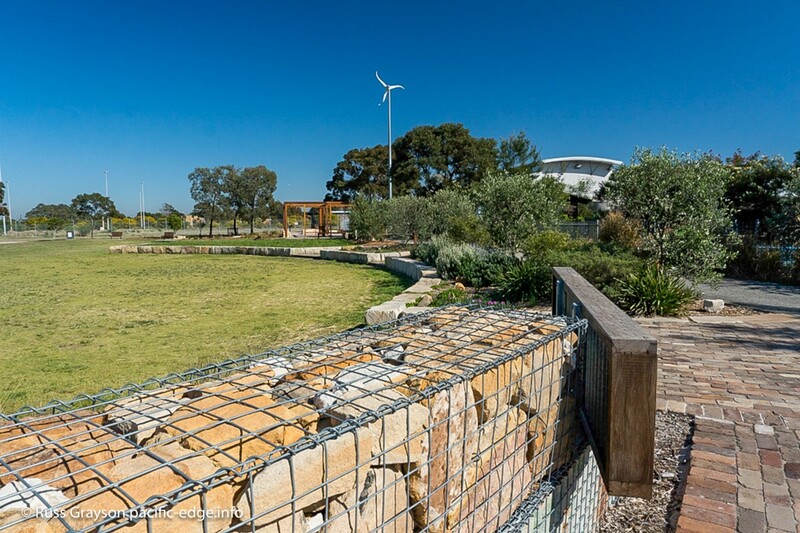 The redesign of the Munda Street Reserve open space is that of landscape architect, Steve Batley, who also has a Permaculture Design Certificate and teaches introductory permaculrture design courses. The design work takes permaculture into local government public place development. For decades, there has been a call within the permaculture movement to mainstream the design system. Now, at Randwick Sustainability Hub, that has been achieved. The Munda Street Reserve, Randwick Community Centre and Randwick Sustainability Hub is located at 27 Munda Street, Randwick, in Sydney’s Eastern Suburbs. The newly-planted cottage garden of native and exotic species and the larger section of the Reserve beyond the sandstone circle is bathed in the warm glow of late afternoon.